If you are staying in Shanghai for the long Summer holidays then we have the perfect opportunity for your kids to get creative! 6/7/8 August: BEDROOM MAKEOVER THEME! Craft activities will include: quote cushions, circle weaving, dreamcatchers, flower letters, geometric wall art, mosaic and much more! Can my child join multiple camps? Yes! We have 14 themes running over the Summer holiday. All of these themes follow the same timetable of sewing in the morning, arts and crafts in the afternoon. Whilst we endeavor for all activities to be different so that a child can join as many camps as they would like, please note that some activites may be repeated but with a different twist e.g. unicorn slime for one theme and galaxy slime for another. 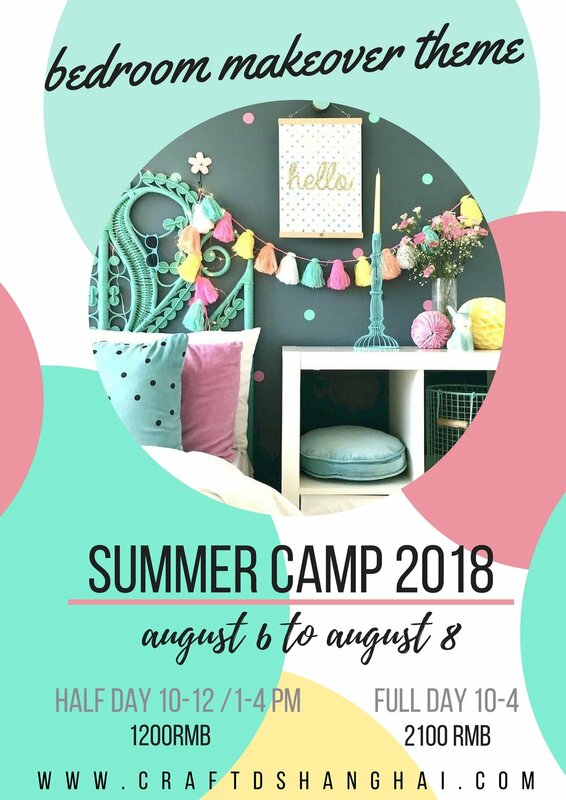 If your child has not attended a Craft'd camp or sewing class before, they will need to join the introductory session at 9.30 on the first day of camp (6th August). This will allow us to run through the basics of how to operate the sewing machine safely and correctly, before moving onto their project for the day, which will be suitable for beginners. Clicking the above link will take you to a registration page. Once submitted you will be redirected to 247 tickets to pay either a deposit or the full amount. Please check our terms and conditions and cancellation policy before booking.